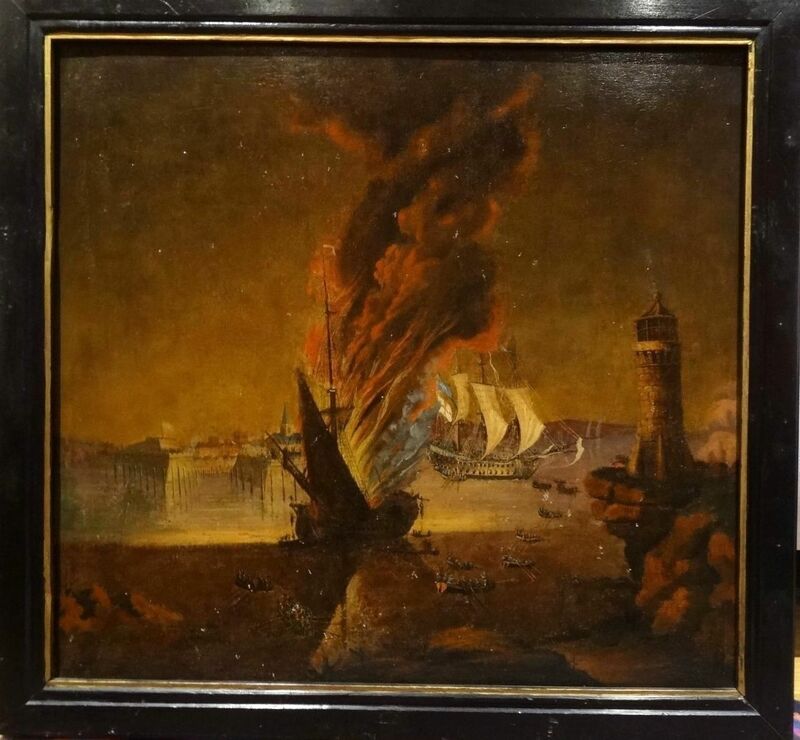 The Siege of Louisbourg, artist unknown, c.1760, eBay. Louisbourg was one of the key cities that British and American forces had to take in order to subdue Canada during the French and Indian War. In order to bring guns to bear on the citadel, General Wolfe seized Lighthouse Point (you can see the lighthouse in the right of the frame) and brought their guns to bear. Weeks of bombardment climaxed on July 21, 1758 when a British mortar struck the powder magazine of the French 64 gun Célèbre. Two nearby vessels, including the 74 gun flagship L'Entreprenant, caught fire. Wind whipped their flames onto the two remaining vessels in the French fleet, which were saved. 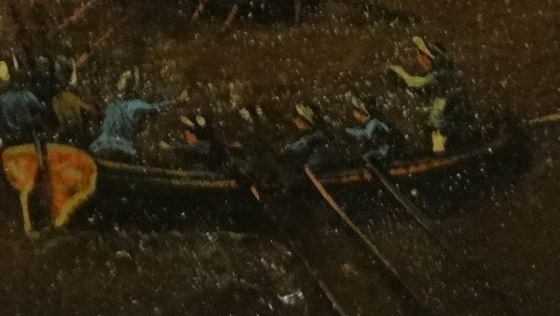 British boats rowed out to rescue the sailors, in a scene that would be repeated at Gibraltar a generation later. Thankfully for the French, much of the crew had been sent ashore to man the fortress, and so spared their lives. 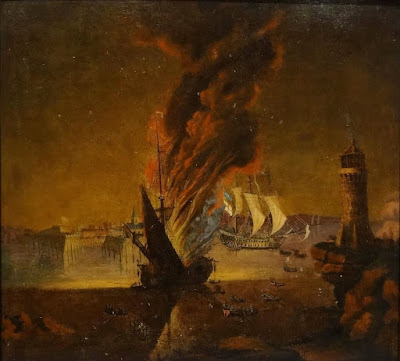 The fires of July 21, 1758 were a popular subject for marine artists at the time. 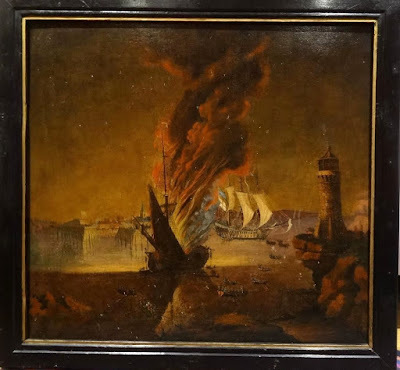 The unknown artist of this piece chose to include the fortress, a British 74 gun (the Terrible, Dublin, or Invincible), a burning French warship, the boats heading out to save her crew, and lighthouse point. It is a crowded canvas. 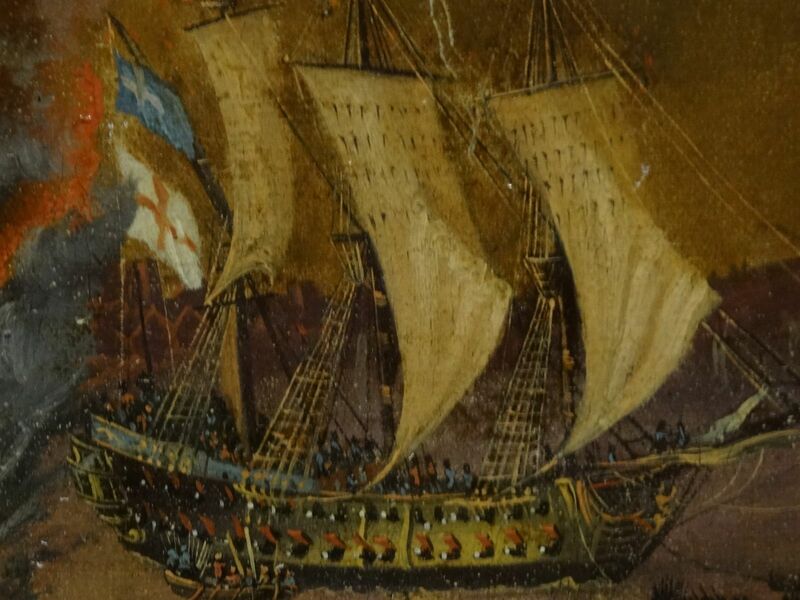 The 74 gun shown here might be the Dublin, which was under command of that legendary naval figure George Rodney. As a side note, the Siege of Louisbourg hosted some of the great British military men of their age, including Admiral Boscawen, George Cook, James Wolfe, and Jeffery Amherst. Her crew are clad in blue jackets and red coats (though these may very well be marines). 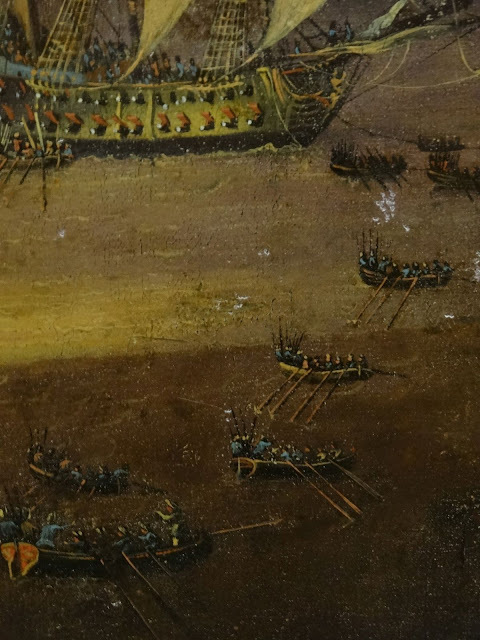 Some of the boats that the warship was dispatched to the rescue of her enemies give us a slightly better look at the men. They are likewise clad mostly in blue jackets, thought a couple of brown jackets have worked their way in. Their hats are a mixture of cocked and round hats, with the possibility of a barge cap in the jockey style thrown in there.